The Cuisinart gr-11 griddler 3-in-1 grill and panini press review will tell you all there is to know about his indoor grill. The actual grilling area is 10.5 x 7.5 inches. Not the largest grill, but since this is a basic grill it is large enough for 4 hamburgers if you make them around 4 ounce. I found doing my research that the opinion sometimes is that it is to big for one person and not big enough for two persons.More about that later. The GR 11 can be used for different types of grilling with a nice range of settings. With the option to use the grill opened all the way you can use it as a regular grill. Both plates will always be on and can not be turned on or of individually. The plates are hinged. By hinged I mean that it will adjust to the thickness of the product you put on it. They kind of float and that means it will touch the meat or sandwich on the total surface. The lights will tell you that the grill is on and when the temperature is reached. Very easy to see that it has warmed up and is ready to use. I did a lot of reading to find all the pros and cons of the GR-11 and came up with this list to help you decide on this electric indoor grill. You can read more in the part where I tell you about my opinion of this Cuisinart GR-11. 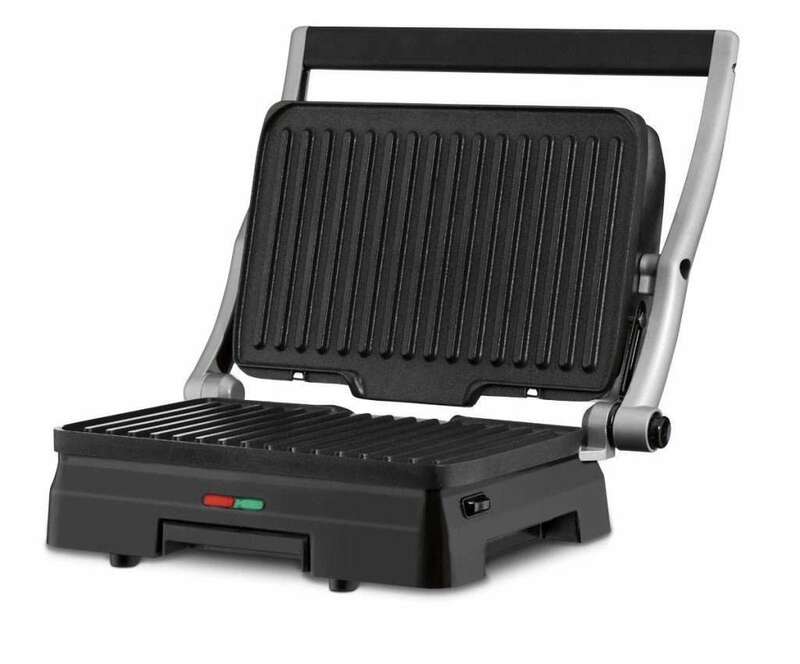 This Cuisinart 3-in-1 griddler panini grill does what it is made for. Heats up fast and makes nice grill marks. The size is a little odd. According to a user to big for one sandwich and to small for 2. There is an option to fold it open all the way and in this way you can double the cooking surface and use it as a grill for kebabs and that sort of food. The option to adjust the front legs so that the grease runs to the grease drip tray faster is a big pro. No more grilling in the fat if you do not want that. I found that the temperature reaches up to 325 degreees (Fahrenheit) and this is hot enough to sear a steak. Overall I highly recommended this indoor grill for smaller households. if you are however grilling for one or two people this grill is great. For larger families or larger pieces of meat I recommend to look at a larger grill like the GR-4N.